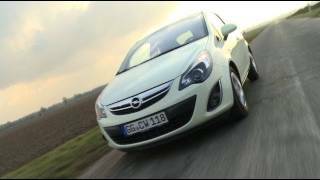 Opel Corsa 2011 features the new Corsa ecoFlex 1.3 CDTI 95 hp engine with Start/Stop technology, a standard on all models. The three-door Corsa version requires only 3.5 liters diesel per 100 km and so emits just 94 g/km CO2. Rüsselsheim. There’s always something happening in the Corsa: Everything changed under its skin in 2010 – its chassis, its steering system and engine line-up. As of January 2011, Opel’s successful small car now gets a new wardrobe. A redesigned face lends it a sportier, expressive look, making it firmly recognizable as a member of the latest Opel design family. A new Corsa ecoFLEX, 1.3 CDTI developing 70 kW/ 95 hp also enters the range, with Start/Stop technology as standard. The three-door version requires only 3.5 liters diesel per 100 km and so emits just 94 g/km CO2. To stay connected with the world, a new multimedia infotainment system with seven, 4x20 watt loudspeakers debuts in the Corsa. Called “Touch & Connect,” this versatile system features a five-inch color touch screen, full navigation coverage for 28 countries, Bluetooth, iPod and USB connections. It is universally connectible, simple to use and has every convenience for the 21st century built in, at a very competitive price. Inside and out, new, contemporary colors and decors are offered. In addition to a modern charcoal hue, the interior can also be dressed with more expressive Tabasco Orange or Steel Blue decors. The new exterior color palette integrates a delicate off-white Guacamole, eye-catching Grasshopper green and daring Henna. In addition, the successful Color Line featuring special, sporty looking versions are enriched with a new optional “Linea” pack, featuring two large stripes stretching across the length of the body with matching colored 17-inch wheels and exterior mirror caps. 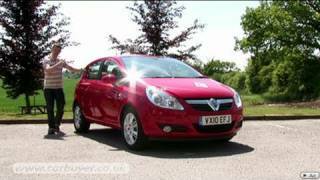 A major player in the European market since 1982, the Corsa offers one of the widest product ranges in the small car segment. It has many features – like a heated steering wheel or FlexFix integrated bicycle carrier – not offered by its peers. The major technological changes made in early 2010 in the chassis and powertrain also make it one of the most desirable small cars around: Its share in the small segment this year has increased in many European markets such as Italy, the UK, Spain and Germany. The small car is a highly popular choice throughout Europe, accounting for some 27 percent of all Opel/Vauxhall sales and placing itself among the leaders in its segment. On average, more than 400,000 units were sold annually the last three years. The Corsa’s latest facelift builds on the strong foundation of its existing, successful design. It still retains its approachable, friendly character, but now introduces a bold, dynamic face seen in Opel’s new design language. The sporty execution is achieved by re-proportioning the upper and lower grilles. The lower grille has become wider and taller, thus visually widening the car. In addition, closer examination reveals that a high degree of attention has been paid to the grille mesh, which replaces the current horizontal grille bars. The result is a car with a more dynamic stance on the street. The proud Opel logo is integrated into a newly designed larger and sculptured chromed bar, adding to the expressive appearance of the front. Chiseled Opel eagle eyes have been added to the new headlamps along with the wing-shaped daylight signature lamp that made its debut in the Insignia and is now featured in all new Opel products. The internals of the lamp have also been refined to create a very jewel like execution that enhances the sporty look. The new fog lamp units with integrated chrome blade complete the more expressive presence of the Corsa’s new face. The new look is further enhanced with six new alloy wheel designs and a large, redesigned Opel Blitz on the tailgate. The Corsa family continues to develop its special, bold sporty models, called the Color Line Series. The successful Color Edition with its black painted roof and high gloss black 17-inch wheels, bright exterior colors and lots of extras already accounts for about 20 percent of all Corsa sales in Germany. As a result of the overwhelming response, Opel is introducing the Color Edition across all of Europe. A new “Linea” pack has been created to attract younger customers looking to personalize their Corsa. It features two large white or black stripes along the Corsa body. The color of its 17-inch wheels and side mirror caps is coordinated with the stripes. The 141 kW/192 hp OPC version continues to top the Corsa family and was also redesigned to match the rest of the new Corsa line-up – especially with new headlamps and a new grille. The Corsa comes in two distinct body styles: the coupé-like three-door and the family friendly five-door. It also continues to offer one of the roomiest and most attractive interiors in its class. All interior trim levels have been updated with new fabrics and/or decors. In addition, they have new dashboard molding sporting textured skin, expressive colors and great attention to detail and quality of execution. In addition to the classical charcoal interior, the Enjoy trim level adds a young fresh look with Steel Blue or is available in Tabasco Orange, which comes with TopTec treatment that protects the fabric. The lively, colored interiors are offset with contrasts in material applications such as pearl white on the console. The colors and instrument panel patterns created through a two-tone effect add harmony to the overall appearance of the interior. The Cosmo has a new grey high gloss center stack bezel with a contrasting wing insert in the instrument panel, plus beautiful embossed seat fabric to give it a very elegant and upscale feel. The new Touch & Connect navigation system is easy and intuitive. Its five-inch touch screen display features both 2-D and 3-D (bird view) maps and SD navigation card. Another new feature is an option to choose the most ecological route, helping to save fuel and the environment. Points of interest can be downloaded by the user. It also has an intelligent commuter function that uses TMC information to propose alternative routes in case of traffic problems, even when navigation is not active. This function is of special interest to commuters who know their routes but want to be informed automatically of traffic jams on their way. Bluetooth connectivity allows for safe, hands-free telephoning – even displaying address books on the screen – and is iPhone compatible. It also allows audio streaming and displays music titles on screen. iPODs have full control and browsing capability with no special cables needed. USB sticks can also be used on the new system. The line-up of the new Opel Corsa ranges from 65 hp to 192 hp. This powertrain family has been revitalized in 2010 with many new engines that reduce fuel consumption and CO2 emissions by up to 13 percent while increasing engine power in most applications. Starting now, eco-friendly Start/Stop technology becomes a standard feature on the Corsa ecoFLEX powered by the 1.3 CDTI 70 kW/95 hp engine. Thanks to this new feature, the fuel consumption in the combined cycle is reduced from 3.7 to 3.5 liters/100 km and the emissions from 98 to only 94 g/km CO2 on the three-door version. The five-door variant achieves 3.6 l/100 km and emits just 95 g/km CO2. It’s mainly in the urban cycle that Start/Stop technology brings its major benefits, with a fuel consumption of now 4.2 liter per 100 kilometers instead of 4.6 l/100 km previously. Start/Stop’s principle is simple: An engine which is not running cannot consume fuel. Instead of idling at a traffic light, the engine stops when the driver engages the neutral gear and releases the clutch pedal. When the traffic light turns green, drivers simply press the clutch pedal to restart the engine, shift into first gear and take off. By eliminating idling time, engines consume less fuel, emit less greenhouse gases and, also, create less noise. Importantly, climate comfort, steering and braking capabilities are maintained to keep occupants safe and comfortable even while the engine is temporarily off. The 1.3 CDTI engine in the new Corsa ecoFLEX 70 kW/95 hp uses a turbocharger with variable geometry and delivers up to a plentiful 190 Nm of torque between 1,750 and 3,250 rpm. A particulate filter is standard. The 1.3 CDTI features closed loop combustion control; it is rare that this sophisticated technology is used in such a small diesel engine. The closed loop system uses pressure sensors in each glow plug to continuously measure combustion quality inside the cylinder. The engine management system then makes minute adjustments to optimize performance and fuel consumption throughout the engine’s life cycle. The Corsa range was rejuvenated earlier this year to provide more power, more driving fun and more comfort with less fuel consumption. 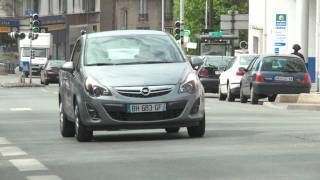 Opel engineers gave the Corsa a complete technical make-over, introducing an enhanced powertrain line-up that reduced fuel consumption by up to 13 percent while enhancing performance. Significant chassis improvements aimed for greater ride comfort with no compromises on agility, while new calibrations improved steering feel and response. True to Opel’s philosophy, the Corsa also features innovative technologies at an affordable price, including halogen Adaptive Forward Lighting (AFL), a heated steering wheel, Hill Start Assist, a Panorama sunroof or the integrated FlexFix bicycle carrier which is unique to Opel. 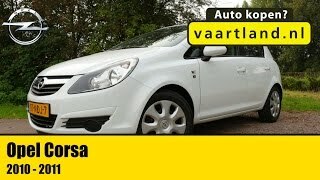 In addition to its athletic, dynamic styling and great driving fun, the Corsa also offers customers top class quality. Germany’s DEKRA Quality Report 2010 named the Corsa the overall winner, with the lowest defect rate of all the vehicles tested. DEKRA (Deutscher Kraftfahrzeug-Überwachungs-Verein) is a full-service provider for safe and efficient mobility and Europe’s leading technical expert organization.